Music Director Roger Prewitt led music in the first service in the new sanctuary at First Baptist Church of Provencal. There is a beautiful wooden cross hanging above the new baptismal. FBC Provencal gifted the steeple from the previous sanctuary to the New Cedron Missionary Baptist Church. Church member, Harold Pitts, then surprised FBC with a beautiful hand made cross that now hangs in the new sanctuary. First Baptist Church of Provencal held a dedication service for its new sanctuary Sunday, Aug. 6. Sadly, approximately 4,000 churches close each year. But in stark contrast, FBC Provencal opened the doors to a beautiful, new sanctuary. It was overflowing Sunday morning. During the standing-room-only service, several speakers gave their remarks. The choir opened the service with a jubilant rendition of “Feeling Fine” followed by the welcome by Bro. Bill Hudson. Russell Rachal led the opening prayer, followed by a solo by Mary Ann Miller. Bro. Bruce Mitchell, retired Pastor of FBC Provencal, gave comments and led the congregation in the Litany of Dedication. Bro. Bruce spoke to the congregation about the history of the building committee’s plans and introduced the building committee’s leader, Bob Miller. Mr. Bob led the dedication prayer and gave a report from the building committee. Bro. Bill Hudson and Pam Cook sang a duet before Music Director Roger Prewitt led the congregation in several hymns. Deacon Terry Broadway gave an offertory prayer. Bro. Bill Hudson and Pam Cook sang a duet during the dedication service. District 8 Associational Director of Missions Bro. Ron Thompson offered support to thecongregation and gave remarks as to the beauty of the new sanctuary. Betty Ford then played the piano and sang, “I’ll Praise You.” Bro. Bill Hudson then gave the message, “Now What?” Following the message, the church hosted a lunch for everyone. Bro. Bill Hudson and his family were honored for their third anniversary as leaders of FBC. In the new sanctuary there is a beautiful wooden cross hanging above the baptismal. FBC Provencal gifted the steeple from the previous sanctuary to the New Cedron Missionary Baptist Church. Church member, Harold Pitts, then surprised FBC with a beautiful hand made cross that now hangs in the new sanctuary. FBC leaders also recognized the Provencal United Pentecostal Church, Dorinda Richardson, Bobby and Mary Beth Wilbanks and Janet and Terry Broadway for the beautiful flowers that decorated the foyer and the sanctuary. Community members are invited to attend services in the new sanctuary as the congregation continues to celebrate the completion of the beautiful, much larger sanctuary. 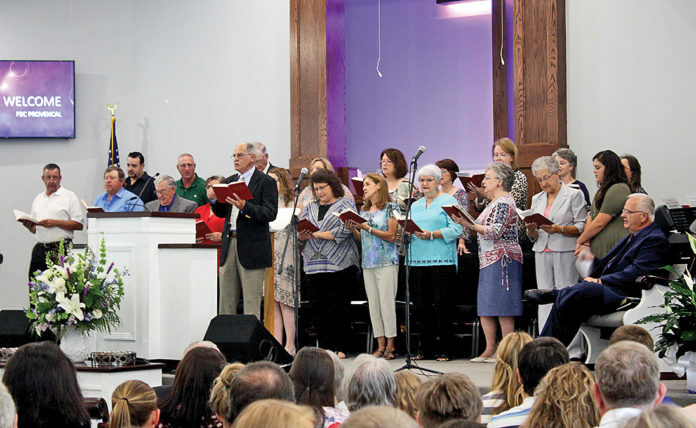 Services are Sunday morning at 10:45 a.m. and evening worship at 6 p.m.
First Baptist Church of Provencal held a Dedication Service of the new sanctuary during morning worship Sunday, Aug. 6.